NEW ORLEANS – There’s no fooling around here as April Fools Day brings with it the latest edition of the NCAA Division I Women’s Outdoor Track & Field National Rating Index which was released by the U.S. Track & Field and Cross Country Coaches Association (USTFCCCA) on Monday. While the top of the charts didn’t experience too much of a shakeup, 20 of the top-25 teams in the country experienced some sort of change after competition from the previous two weekends. Keep checking in as many changes will occur before the nation does battle at the 2019 NCAA DI Outdoor Track & Field Championships hosted by the University of Texas in Austin, June 5-8. Holding the top spot in the country for the second week in a row was Southern California. The Women of Troy were off from competition after they opened the outdoor season with its Trojan Invitational on March 15-16 and the Power 5 Trailblazer Challenge on March 23. The team will be back in action this weekend with the Jim Click Shootout in Tucson, Ariz. Jumping up two spots to No. 2 was Arkansas which is the best ranking for the program since Week 3 of last outdoor season. The Razorbacks had athletes at both the Stanford Invitational and the Texas Relays over the weekend. Top performances from the meets came from the group’s 4×100 unit which is ranked fifth nationally along with Taylor Werner who is now eighth in the 10,000 in the TFRI Individual Rankings. Slotting in behind them after a one-spot drop was Texas A&M. The Aggies were also at the Texas Relays, along with some of the other top teams throughout the county. The performances that were added to this season’s TFRI rankings came from the groups 4×100 unit (second overall in the index) and Deborah Acquah (now 25th in the TFRI Individual Rankings in the long jump). Coming in at No. 3 after a one-spot fall was LSU. The Tigers roared at the Stanford Invitational and the Texas Relays with the focus going to stand out Sha’Carri Richardson who is now 14th overall in the 100 in the TFRI Individual Rankings. She also ran the final leg of the team’s 4×100 relay that has LSU ranked fourth overall. Jurnee Woodward also posted a strong performance in the 400H where she is currently ranked 14th in the TFRI Individual Rankings. Holding steady at No. 5 for the second consecutive week were the Ducks from Oregon after competing at the Stanford Invitational. The best showing from the group came from Jessica Hull who is now ranked sixth overall in the TFRI Individual Rankings in the 5000. Carmela Cardama Baez is now 22nd overall in that same event, while Susan Ejore is 33rd in the 1500. The rest of the top-10 was rounded out by Florida State, Florida, Alabama, Kentucky and Miami (Fla.), in that order. The biggest improvement in the top-25 was taken by No. 25 South Carolina after a 49-spot increase from the previous index. It was the best mark received by the program since Week 6 of the 2017 season. No. 11 Texas, No. 23 Baylor and No. 24 BYU all shot up eight positions. The largest leap overall went to No. 78 Northwestern State after a 68-spot increase. On a conference level, the SEC leads the nation as nine of their 14 member institutions are ranked in the top-25. Behind them is the Pac-12 (six teams in top-25), Big 12 (four), ACC (three) and Mountain West (two). 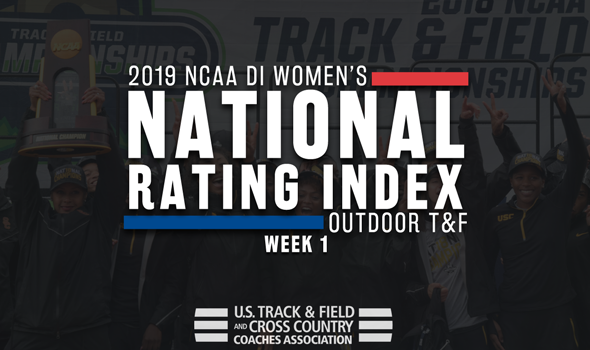 The next DI Women’s National Track & Field Rating Index will be released on Monday, April 8.